Our school has 75 children – one third from the Home and two thirds from impoverished families living in and around Beirut. A significant number of these are Syrian, Iraqi, and Sudanese refugees. Many of our boys at the Dar El Awlad Home come to us several years behind in their education. Others have learning problems that make it difficult for them to cope with the stress of studying in a mainstream government school. 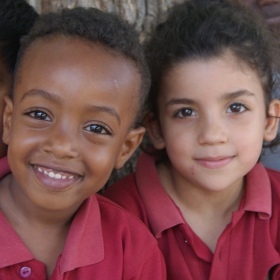 Dar El Awlad School was started in the late 1990s to address these challenges and help with the education of community children from many different nationalities. Each class has a limited number of students, 12 or fewer, so that every child receives plenty of personal attention and help with studies. The walls of Dar El Awlad School are painted with bright colors – most unusual for a Lebanese school – making for a fun and stimulating learning environment. Our school also has a library and an outdoor playground area. In addition to the basics of mathematics, English, and Arabic, the children study art and music. Computing and other practical skills are another part of the curriculum. Nutritious lunches, sports, and devotions are also offered as we seek to support the physical, spiritual, and educational needs of each student. And there are great opportunities for missionaries to come and serve here as teachers! The Dar El Awlad School is making a difference for children who would otherwise fall through the cracks in Lebanese society. Not only does education give them tools to become independent, successful adults, but reduces the likelihood that they will fall prey to extremism. Most importantly, Kids Alive is ministering to them with the love of Christ. Support the Ministry of Dar El Awlad School with Your Gift Today.